To some people an operating system is an operating system. It is a means to an end. Many Windows users definitely look on life in this way. A lot of Windows user buy a computer and that computer happens to have Windows on it. Windows lets them connect to the internet via a browser and they can read their email, watch videos, check their mail and perform office type tasks. The fact that the computer is running Windows is irrelevant to them. They certainly wouldn’t spend time discussing their operating system or reading articles about it. There is nothing wrong with that mentality. In a similar way I use a car to get me from A to B. I’m not particularly into engines and fast cars (although I do go rally driving with my father in law a few times every year, all around Scotland). I certainly don’t read articles about cars or visit car based blogs. Quite often though Linux users not only see Linux as an operating system but as a way of life. I read lots of articles every day from different people who write about Linux. There are various methods I could use for visiting each site. 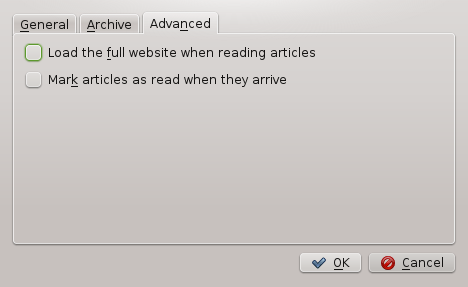 I could bookmark all the pages in my browser and visit them one by one, or I could visit a news site such as LXER or Linux Today and wait for people to post articles. Some people don’t post their articles on news sites or they don’t post them straight away. I know that if I have a series of articles I quite often publish them on this site and then write an overview article. It is the overview article that I send off to LXER and Linux Today. Sometimes I write articles that only people who subscribe to the feed will ever know about. 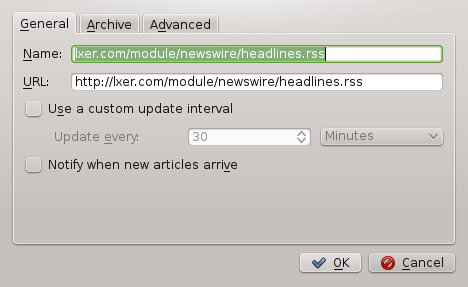 To be able to satisfy my daily news fix I use an RSS feed reading tool. This provides all the links to all the sites in one handy place. If there is nothing new on the sites I like to visit then I don’t need to go to the website to find this out. Now we have that cleared up lets move on. Still confused? Let me explain in more simple terms. This website has articles on it. Over 190 of them in fact. When you view this website in a browser you will be seeing the HTML feed which is a markup language used to present web information. Other websites can also present the information on this site by subscribing to the RSS feed and presenting them in any way they see fit. As a site owner I can determine the contents of my feed and how many articles are fed through at any point in time. For the average person RSS feeds might not matter all that much because they can happily read the articles on the site they were first released on but as mentioned earlier you can save yourself the hassle of visiting all the sites by using an RSS reader. Which sites have an RSS feed? Loads of web sites have RSS feeds, especially if they are providing news, opinion or how to articles. To find out whether a website has an RSS feed look for the standard symbol used across the internet as shown above. Sometimes people don’t use the icon but they will have a link for subscribing. Quite often the subscribe link takes you to the RSS feed although sometimes you will be asked to join a mailing list which isn’t quite the same. Akregator comes pre-installed with the latest version of openSUSE with the KDE desktop. If it isn’t pre-installed as part of your KDE based Linux distribution then use the associated package manager to install it. 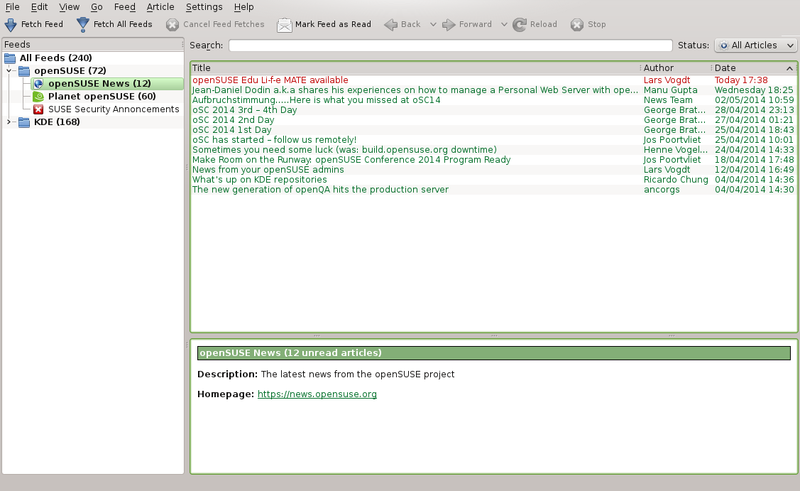 The openSUSE version has the openSUSE feeds and KDE feeds already set up. There really isn’t much to the feed reader. It is purely designed to make it easier to read feeds from different websites. The application is split into three panes. 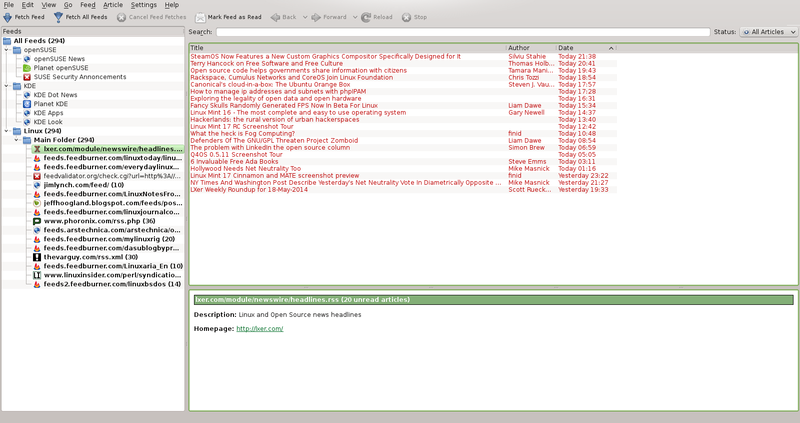 The left pane has a list of folders that are your RSS feeds. 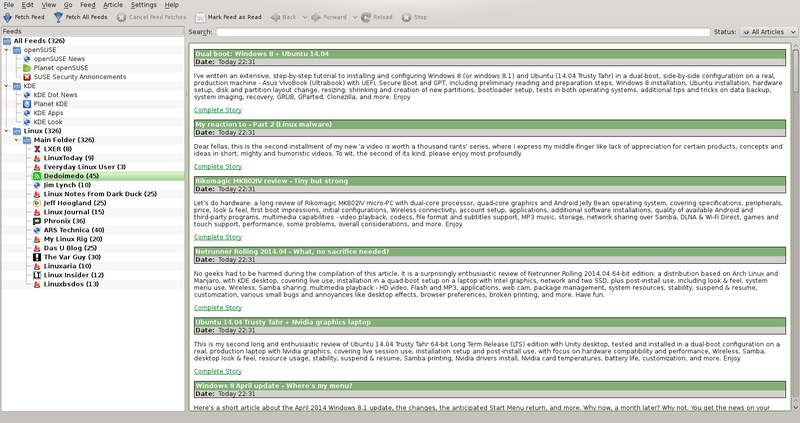 The top right pane has a list of articles for the selected feed and the bottom right pane has a preview of the article. Obviously you would prefer to read your own choice of feeds rather than the default ones set up for you. The first thing you might like to do is create a new folder. To do so right click the mouse on “All Feeds” and select “New Folder”. Enter a folder name and press “OK”. To add a feed all you need to do is right click on the folder you just created and select “Add Feed”. You will be asked to enter the feed URL. To obtain the feed URL go to the website of your choice and look for the RSS symbol shown in the previous section and click on it. (Practise with this site if you like). 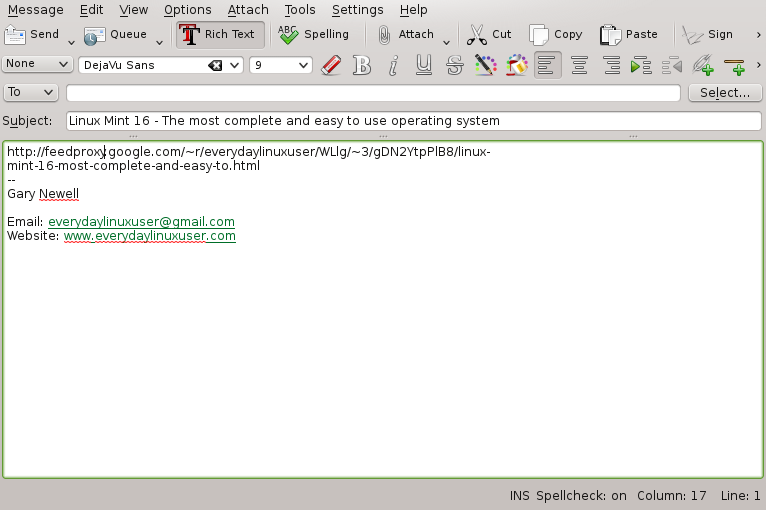 Copy the RSS feed URL and paste it into the feed URL within Akregator. Click “OK” to continue. As you can see I have a whole host of feeds that I read on a daily basis. To read any of the articles, click on the link in the right pane and get a preview in the bottom pane. If the preview looks good then there is the choice of double clicking the link to open the article in the browser or right click and select view in new tab. You will notice that in the image above the list of feeds isn’t particularly well ordered. This can be changed at any point by right clicking on the link and selecting “Edit Feed”. You can change the name to make it easier to read on the screen or if you got the URL wrong then you can amend it here. It is also possible to set up notifications to let you know when new articles appear for a particular feed and you can also set how often Akregator looks for new articles on that feed. The “Archive” tab lets you organise your feeds so you can determine how long links hang around. The options are fairly self explanatory such as “Keep all articles” or “Limit articles to n articles” where n is the number of articles you want to keep. Finally the advanced tab has a couple of options available. To be honest this should be renamed “Miscellaneous” as there is nothing advanced about these options. “Load the full website when reading articles” loads the full article into the pane at the bottom as it appears on the website. “Mark articles as read when they arrive” marks articles as read when they arrive. (very cryptic I know). You can change the look and feel of Akregator. For instance you can get rid of the preview pane at the bottom and have one long list of articles as shown above. If you really like an article then you can share it with friends via email or via Twitter. I have to admit I didn’t manage to get the share by Twitter working. After you have created a list of feeds that you read regularly, you might get to the point whereby you want to have the same feeds on a laptop and on a netbook or across many multiple devices. You don’t want to have to add each feed manually for each computer. If you select “File” and then “Export Feeds” from the menu you will be able to save the file to XML. The file will be in a standard OPML format. What is an OPML file I hear you say? Basically an OPML file contains a list of links to RSS feeds. You can then import that one OPML file into your chosen RSS reader and all your feeds will be imported. To import an OPML feed into Akregator choose “File” and then “Import Feeds”. You will be able to choose the OPML file wherever you saved it and then enter a top level folder name. I have done this before but last time I put the file on RapidShare and after a while RapidShare deletes the file. I have now recreated my OPML file on Google Docs and made it available for download. 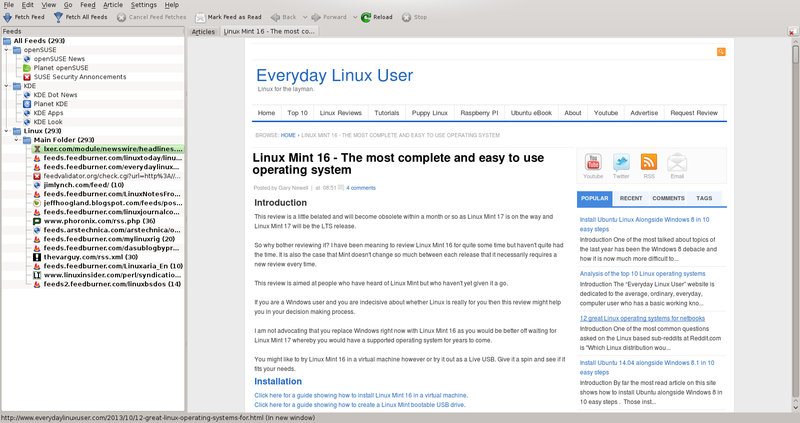 Click here to download the Everyday Linux User OPML file. RSS readers are great tools for helping you manage the links for the sites you read on a daily basis. Never again will you have to visit a site to see if there are new pages. Simply open your reader and select fetch feeds instead. Akregator is a simple and easy tool to use. If you already use KDE and have it installed and you have never bothered with it before, well now you know why it is there. If Akregator had 1 killer function, I'd use it: online sync. I use feedly.com for this exact reason. I read RSS from several devices: pc / laptop / tablet / mobile. Having to re-read already read feeds would be a PITA. 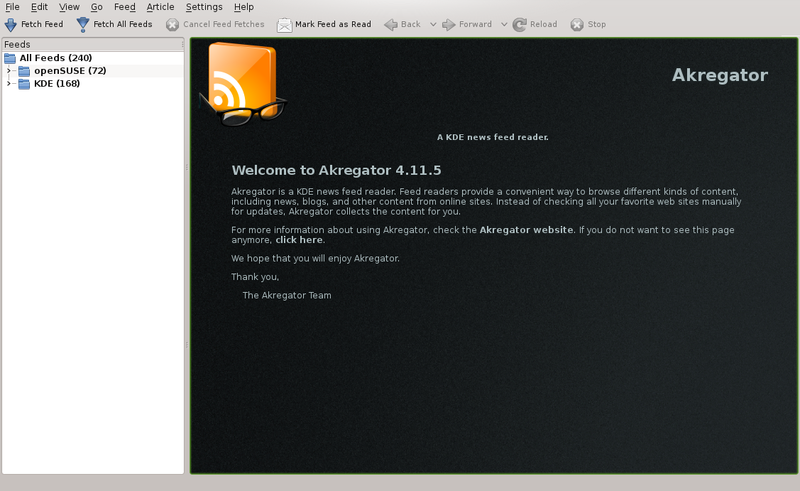 I really wouldn't call Akregator a premier RSS reader. It seems to be essentially a dead project, having received no bug fixes in at least two years. There are open bugs for Akregator in KDE's bug tracker dating back to 2004. Although Akregator visually integrates with the rest of KDE4, in most respects it more strongly resembles a KDE3 application. It doesn't integrate with Akonadi/Nepomuk like other components of the KDE PIM suite do. I used to be a heavy Akregator user, but I became frustrated with its impact on my system's performance. I had less than two dozen feeds and the program would frequently use over 1GB of memory by itself. Google Reader proved superior to Akregator in every respect. When that was shut down, I switched to Tiny Tiny RSS, which I think is generally superior to what Google Reader was. Agreed. Tiny Tiny RSS is the king of Open Source feed reader apps. I need to find an app that is local desktop app that syncs to my TTRSS server as the backend because TTRSS is unmatched overall, the interface is quite ugly and cumbersome.